Apple picking in the fall is one of life’s true pleasures—just like making pies, muffins, and apple sauce after you get home with your harvest! 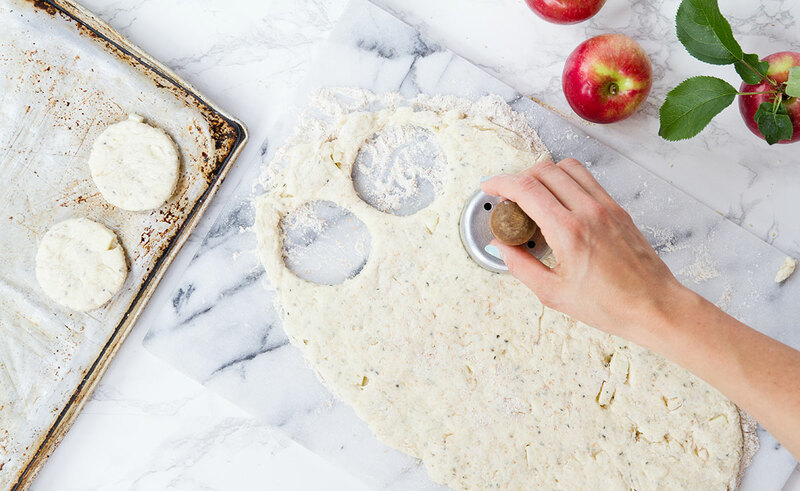 This year, why not put a new twist on tradition with apple, honey, and ginger scones. Crispy and golden on the outside, soft on the inside, scones are much less rich than most other pastries. They make a delicious breakfast alternative to croissants. Replacing part of the flour with hemp seeds is a great way to boost the nutritional value of these scones without sacrificing taste. Hemp seeds are high in protein, fiber, vitamins, and omega-3 fatty acids. Served with apple butter, cheese, and a nice tall glass of Natrel Lactose Free, they really start your day off on the right foot. Place the oven rack in the middle position. Preheat oven to 180 ºC (350 ºF). Line a baking sheet with parchment paper. In a bowl, combine flour, hemp seeds, baking powder, salt, ginger and sugar. Cut in the coconut oil using two table knives. Add diced apples and Natrel Lactose Free. Mix well using a knife. Knead just enough to get a smooth, non-sticky dough. Too much kneading will result in dense scones. Add flour if necessary. 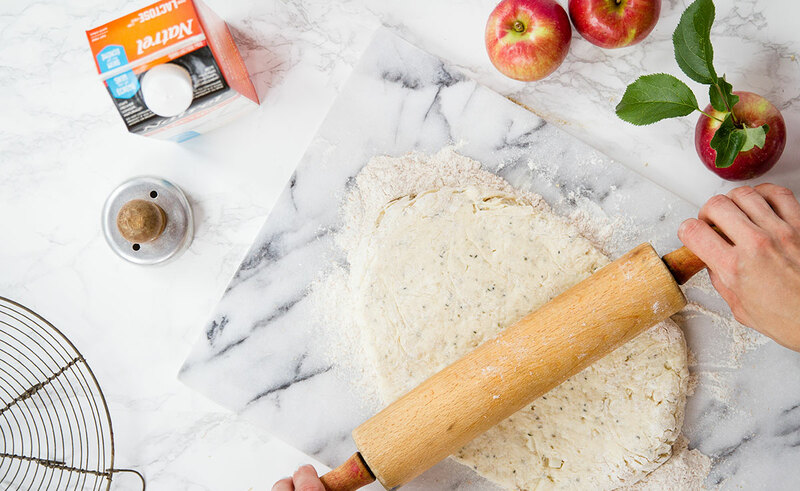 On a floured work surface, flatten the dough using a rolling pin or your fingers to about 1 to 2 cm (½″ to ¾″), as desired. Using a 6 cm (2½″) diameter cookie cutter, divide the dough into 10 circles. Arrange the scones on the baking sheet. Cover with a cloth and leave to rest in a warm place for 30 minutes. Bake 15 to 20 minutes. Let cool. 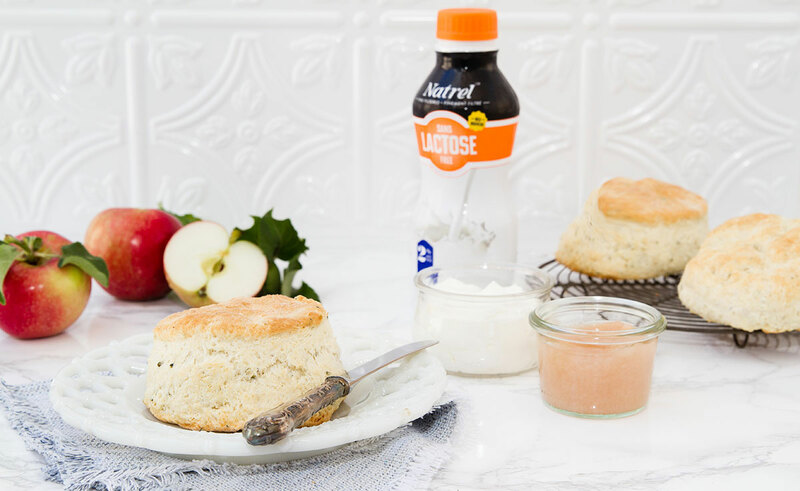 Serve at room temperature with sugar-free apple sauce or cheese and a Natrel Lactose Free 2% on the go.